KABUL, Afghanistan (CNN) -- A car bomber targeted a U.S. base in eastern Afghanistan, killing seven people Wednesday, a day after Taliban militants attacked many locations in the city of Khost, U.S. military officials said. The suicide bomber drove his vehicle near the entrance of Camp Salerno, near Khost, on Wednesday morning. The explosion killed mostly Afghan civilians and injured 21 others, law enforcement said. Authorities had no information about whether there were U.S. casualties. U.S. military and local officials also reported fighting in the southeastern province of Paktika on Tuesday morning. Taliban fighters attacked Afghan security forces, and U.S. forces joined the battle. Six Taliban fighters and two civilians were killed. Also on Tuesday, a Taliban suicide bomb squad disguised as regular Afghan army troops stormed the strategic city of Khost, close to the border with Pakistan Tuesday, prompting a fierce six-hour battle with U.S. troops, local officials and the U.S. military said. 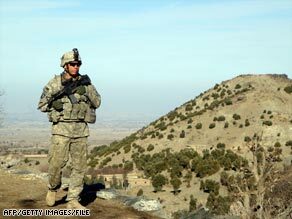 The insurgents attacked a municipal building in the center of the city, a U.S. military spokesman said. At least 10 suicide bombers were killed in the attacks, which also left five troops and four civilians dead, Afghan police said.